Karrke Aboriginal Cultural Tour is owned and operated by Christine Breaden - Traditional Owner and partner Peter Abbott who live in a small Aboriginal community called Wanmarra. Wanmarra Community is 450kms south west of Alice Springs, we share the south eastern boundary of the Watarrka National Park (Kings Canyon) area and we are situated 36kms from the Kings Canyon Resort and Rim Walk Eastern end. 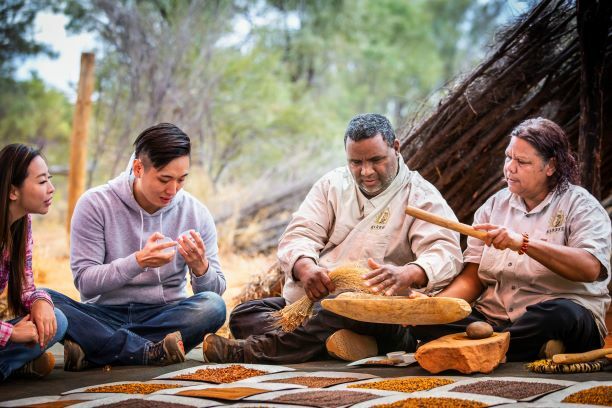 Our cultural tour is a one-hour small walk and talk on the traditional lands of Wanmarra family group sharing with visitors Luritja and Pertame (Southern Arrernte) language and culture, we explain in great detail bush tucker and medicine, the making of spears, boomerangs, music sticks and native seed jewellery up close. Our tour is a See it, feel it, experience it suited for all family groups, students, educational groups, free independent traveller, inbound operators and seniors. We have shaded display areas with seating. The access road to Karrke Aboriginal Cultural Experience is a 2 kms of unsealed road from the Luritja Highway (signposted) opposite Kings Creek Station. Operating Days: Wednesday to Sunday from 15 January to 15 November inclusive. Photographs are very welcome. We respectfully ask that there be NO filming and or voice recording on the tour. We do not do pick ups it is a self-drive to our tourism site from Kings Canyon Resort and Kings Creek Station. All prices are displayed in AUD GST included and subject to change.